But not everyone can afford them. At least, not me. I cannot cough up coins to catch some shoes most likely I will wear only once. And yet, I still wanted a pair. A pair of shoes cool and sleek, without breaking bank. 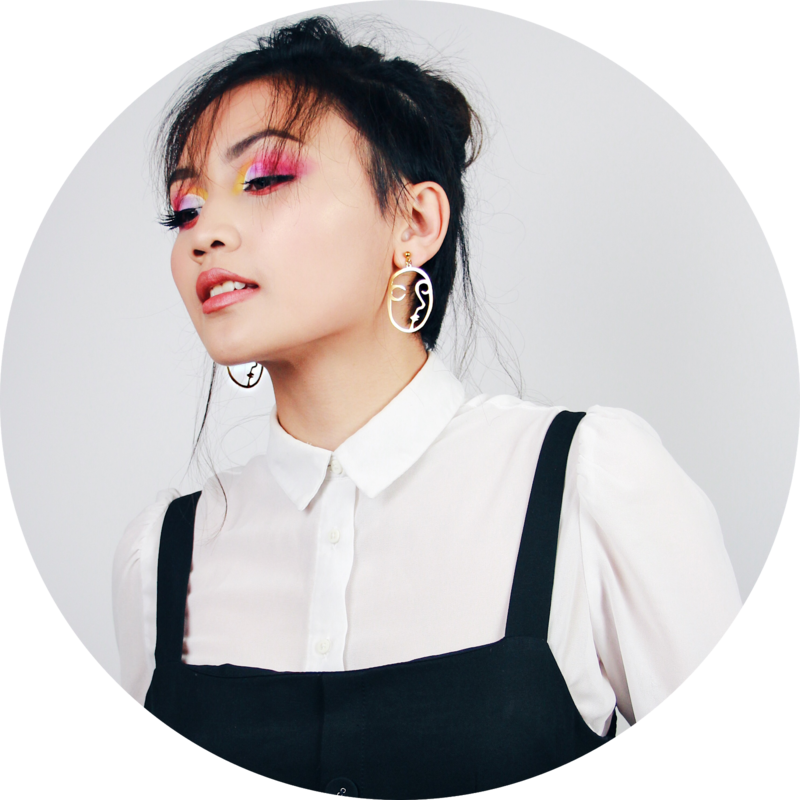 Cute and wearable. None came along that seemed worth it to me. So with some old fabric and trusty tools at home, I made my own. And with that, I made a tutorial. 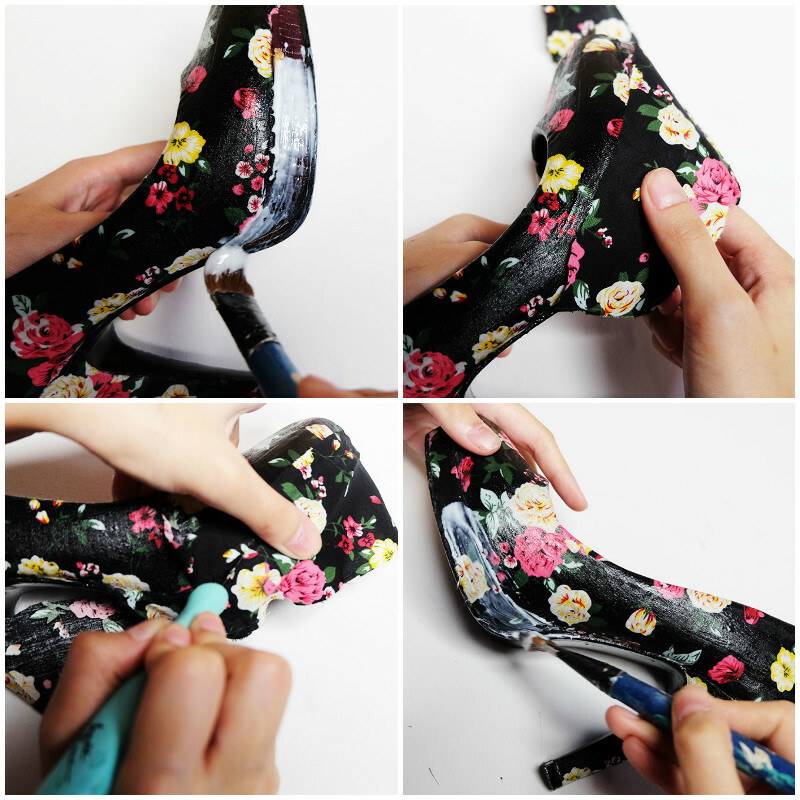 How to DIY Statement Shoes! | PAINTBRUSHES | Grab some paintbrushes you don't mind destroying. We'll need this to paint the glue on, then promptly toss away. 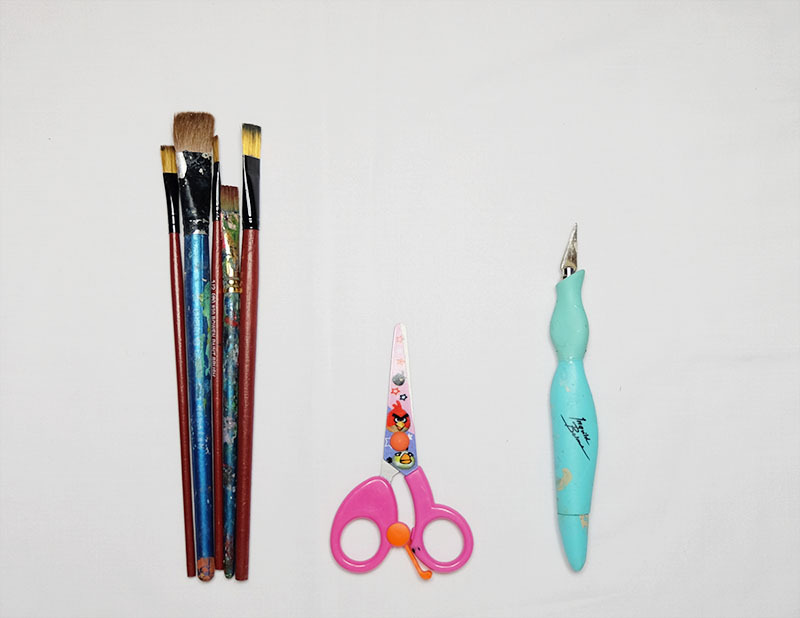 | SCISSORS & X-ACTO KNIFE | Your tools for cutting. Scissors for large areas. An X-Acto blade for sharp precision in the crevices. If you don't have an X-Acto, you can use a cutter. No matter what you use, always remember to BE CAREFUL. I don't want anyone slicing fingers on this project. | SHOES | Obvious reasons. While they are no specific shoe type in this case, I would recommend using an old pair that isn't suede. These heels are made of thick synthetic leather, I found just lying around. | FIXATIVE SPRAY | The fixative finish. You don't need to use this but it is an extra step to seal the fabric with little rips. Consider it a preventative measure. | MOD PODGE | There are different kinds of Mod Podge. For this tutorial, I'm using the Matte Finish. If you can't find Mod Podge, You can use School Glue (the white liquid) instead. It will give you the same outcome but won't hold up for long. 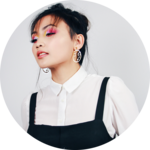 | FABRIC | Find thick material, that isn't sheer. For the best outcome, a dark hue like deep maroons or navy blue is suitable. This cloth is made out of Japanese Cotton. I didn't pay for this since it's my mother's leftover fabric. You can easily find some lining for $2. 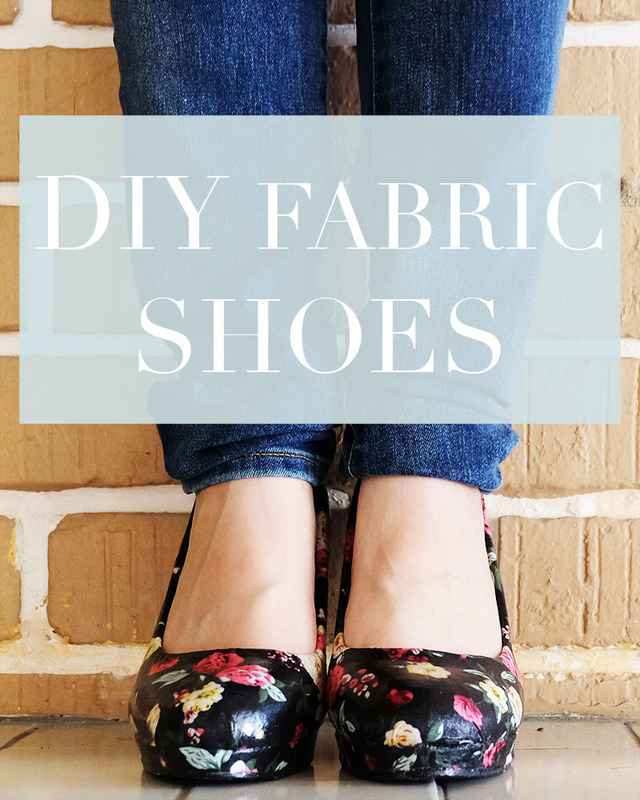 You will need to cut different parts of fabric for your shoes. Some shoes won't need this much fabric, some might need more. A general rule, leave three inches of extra fabric as a precaution. You can always cut this later. For these pumps, I cut four pieces. I spray painted the soles black prior. You don't have to do this. This is an old pair, I wanted to give it new life. So to speak. Also, a black sole would coordinate with the dark floral pattern. Just spray two even coats of Acrylic Spray Paint, and a final coat of Fixative Spray. 0 1 | Start with a clean shoe. By that, wipe it off dust and dirt. You'd be surprised how many little specks there are hidden underneath. 0 2 | Begin with the heel, painting a thin coat of glue all over. 0 3 | Before the glue dries, apply the corresponding piece on to the heel. Smooth it out. Be careful not to leave any air bubbles in the fabric. 0 4 | For the sides, use scissors to cut the extra fabric. Be sure to leave at least half an inch of fabric. This is so you won't cut too much off. 0 5 | Use the X-Acto Blade for precise cuts. This is incredibly helpful for the curves. Be careful. Cut with small strokes, it makes it easier to remove the excess evenly. 0 6 | Once complete, apply another thin coat of glue in a downward motion. This is to hide any hanging threads. The rest of the shoes follows the same instructions. Repeat for the entire shoe, with just a few minor additions. Take for example; the body. | For the body's fabric, cut the piece in half from the back to the centre. 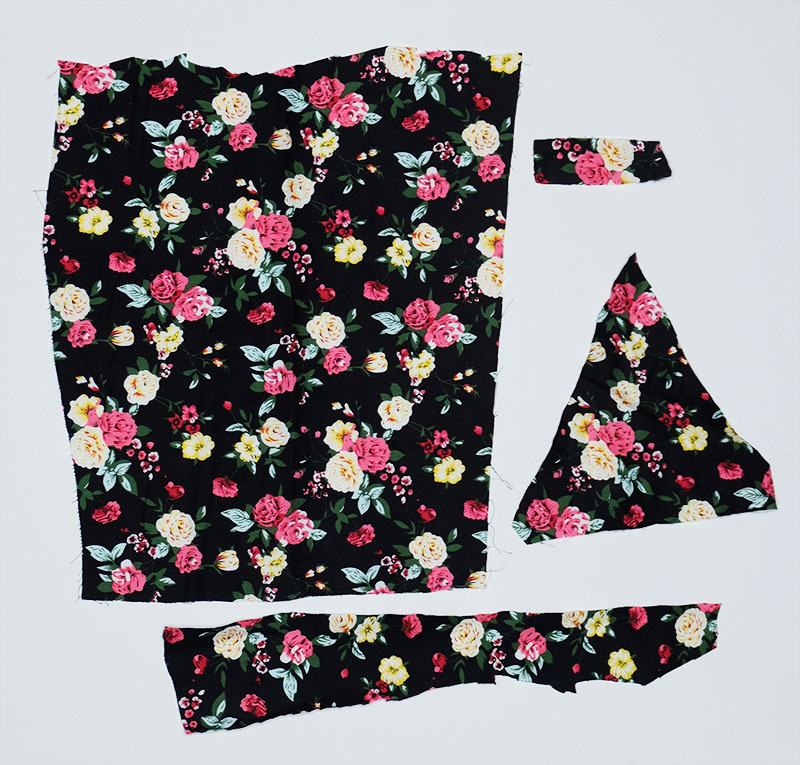 Leave the front uncut so the Rectangle Fabric resembles a U-shape. 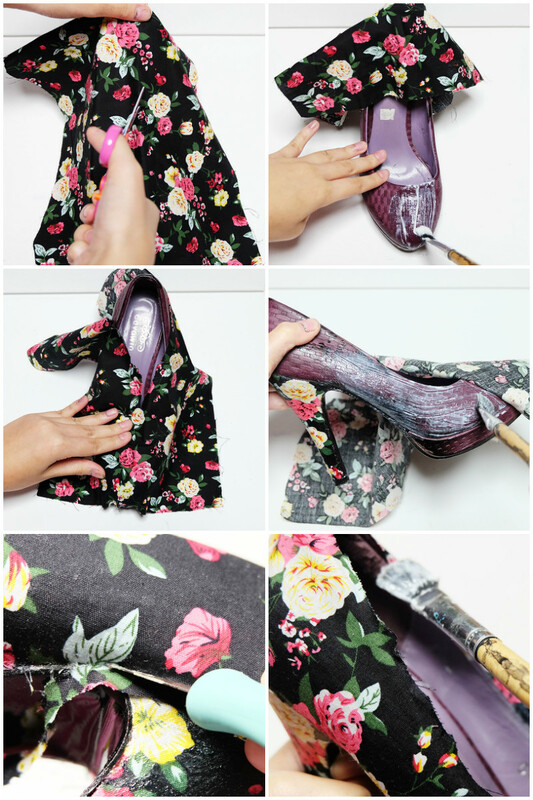 | To hide the raw edges, simply paint the fabric down to the back of the shoe. But this might irritate your feet so cut it first. Leave only half an inch of space before gluing down. | Always leave a few inches of excess fabric between the space. You can always cut it away with the blade. 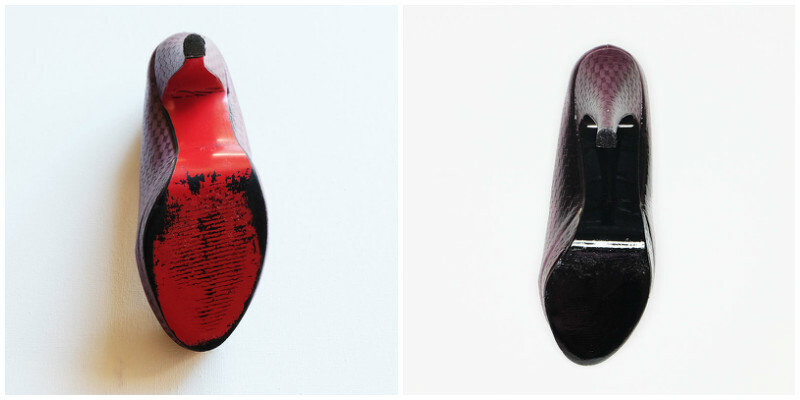 Once you get these steps down, making these shoes will be a breeze. Just glue, fabric, cut and glue again. 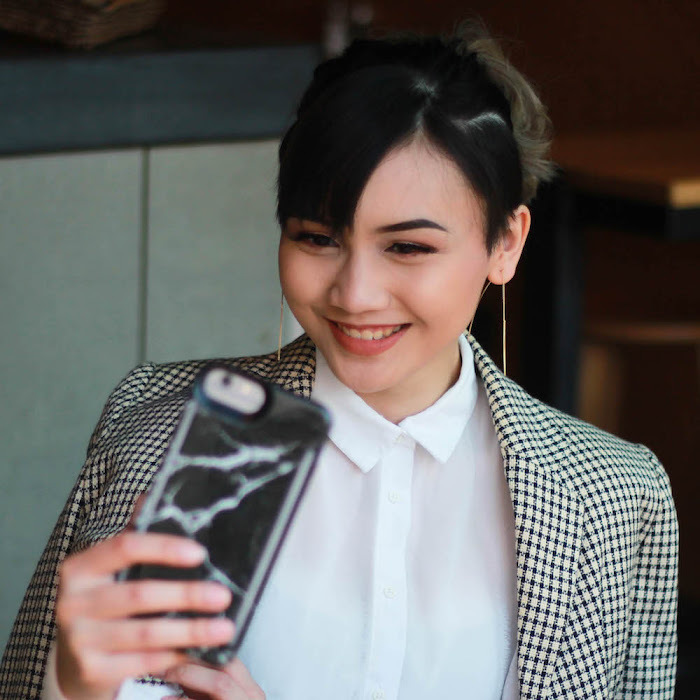 When you're complete with the general look, you can take these final steps to finish. | I put a small rectangle at the back of the heel. Wide enough to hide where the body's fabric began. This just makes the shoes look well-put. 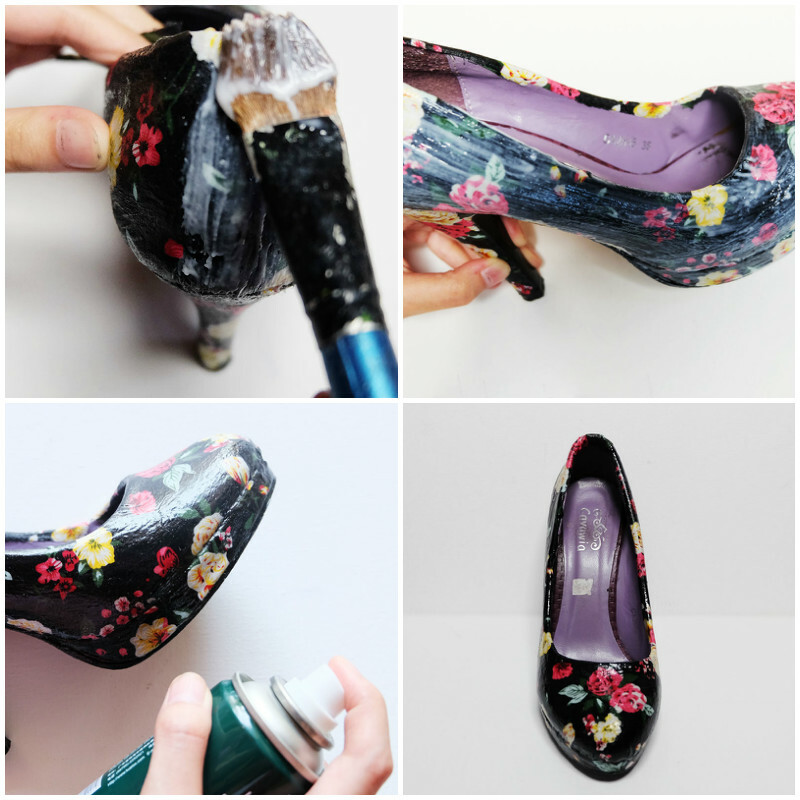 | Paint one last coat of Mod Podge all over the shoe. 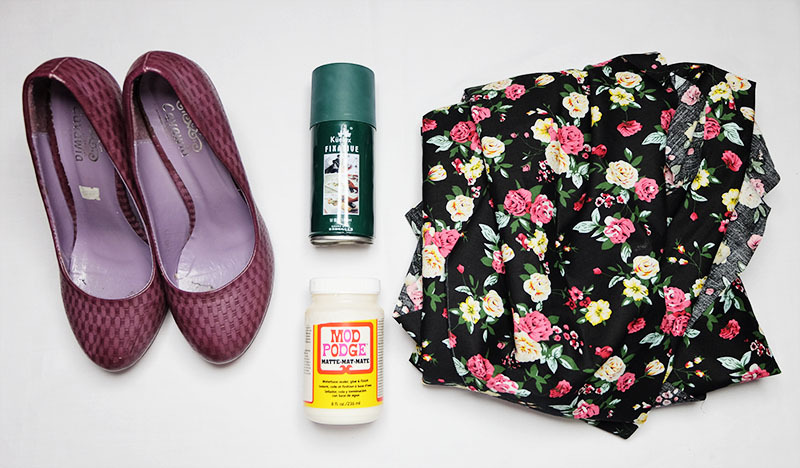 | Spray a thin coat of fixative spray over the shoes. This will not only seal the fabric, but also give the pair a shiny effect. Some like it, some don't. This is entirely optional. | Leave the shoes in an dry, open space overnight. And in the morning, it should be ready to wear! A quick tutorial for cheapskates like me. Seriously. I didn't pay a dime for these shoes, using products I already had at home. Even buying the tools like fabric and glue is less than $20. Much cheaper than a pair of branded statement shoes. This project is so much fun to do on a lazy afternoon. A productive way to pass the time as I made the first shoe while watching a movie.